ASSHOLES WATCHING MOVIESThe Hateful Eight!!!!!!!! I JUST got back from seeing the 70 mm version, complete with overture and intermission. I agree–the first half was a real treat; the second was–well, I won’t say more because I don’t want to ruin it for anyone else. But I didn’t think it was his harshest. All in all I enjoyed it. Sold out theater. I wish I could have seen it in 70 mm. The intermission and overture were actually really good ideas I thought. Maybe I am getting soft then. I just found the cruelty was handled with such glee that it was unusually unsettling for a Quentin Tarantino movie. For me, this is the best film of 2015. That’s all there is to say. I love Carol and I still have lots left to see but it’s definitely up there for me. I’m already anxious to see it again. i just started seeing commercials for this movie… i knew as soon as i saw it.. had to be Q.T. and to answer you ? just from the commercials..im going to say YES. not sure yet if ill go see this one. If you liked Resevoir Dogs and Django Unchained, this one’s for you. I’ll be seeing this eventually, I’m always far behind as we wait for them to turn up on Sky, but it’s definitely on my list! I’ll be excited to hear what you think. Looking forward to this one hitting the cinema over here! Dare say it’ll be my favourite movie of 2016! Just saw it today. I found the first half to be on the slow side but I held on until the second half which won me over. I relished the first half. I couldn’t believe that we pretty much made it to the halfway point, apart from all the abuse that Jennifer Jason Leigh takes, without a single act of violence. I thought the first half was Tarantino dialogue and characters and the second half was Tarantino violence. This one’s pretty extreme so you’re making the right choice by avoiding it. We kind of wanted to see this, but three hours? I don’t think Lord Drollery can sit still that long. Even longer if you see it in 70 mm with the overture and intermission. The time flies though, I have to say. Fantastic review mate!! I can’t wait for this to come out, only two more weeks!! Sounds like the wait will be worth it! I thought so. I’ve been waiting for this one for a long time. I’m glad he decided to make it after all. Great review and analysis. Being a Tarantino flick, I was expecting the usual 10 out of 5 performance. Like you, I loved the first few chapters, but it actually went a little south. I love the slow deliberate pace of QT films, but here it actually felt slow at times. 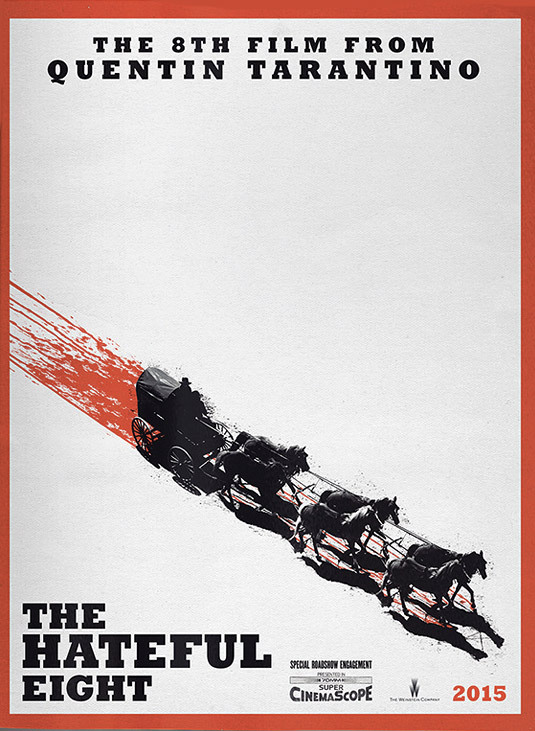 The violence is brutal for sure, minus the satisfaction of Django’s gore. The performances are great and the storytelling is bold, but for me this ranks low in this mad scientist’s oeuvre. I need to see it again maybe. It is on my list. I haven’t even managed to see star wars yet. I was lucky enough to see the Road Show and I absolutely adored it. Don’t know if it was the harshest, but it certainly wasn’t light by the end. It was thoroughly entertaining. Although I’ve seen better from him like Inglorious and Reservoir Dogs. I guess all there is in the end is just nilhilistic violence.